The Sons of Italy Foundation (SIF) presented U.S. Senator Jack Reed of Rhode Island with a lifetime achievement award for his career in public service during its 23rd annual National Education & Leadership Awards (NELA) gala in Washington, D.C. on May 25. Also honored were Carmen Policy, former president & CEO, San Francisco Forty-niners; Steven Nardizzi, executive director, Wounded Warrior Project; and Pier Francesco Guarguaglini, chairman, of the Italian multi-national Finmeccanica, the eighth largest defense contractor in the world. Carmen Policy received the SIF's most coveted honor, its National Education & Leadership Award, which gives the gala its name. Sen. Reed, a West Point graduate who served 12 years in the U.S. Army as an Army Ranger and paratrooper before entering politics, has traveled to Iraq 12 times over the past several years. During his acceptance speech, he thanked the late U.S. Senator John Pastore, the first Italian American ever elected to the Senate, who had sponsored his application to West Point. "America is the work of many hands from many lands," Sen. Reed said. "But in my experience, no hands have given more to America and asked for less than Italian Americans." Sen. Reed was the third non-Italian American to receive this award which was first given to Vice President Joseph Biden in 2009. The 2010 award went to President Bill Clinton. 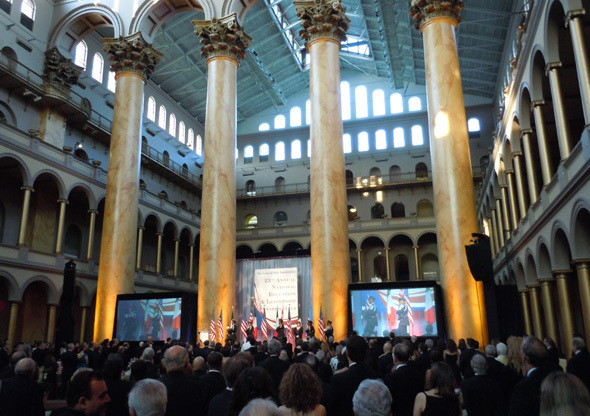 Approximately 800 guests attended this year's gala at the National Building Museum. Among them were prominent leaders from government, business, academia, sports and entertainment, including Gen. Raymond Odierno, commander of U.S. forces in Iraq, and his son, Capt. 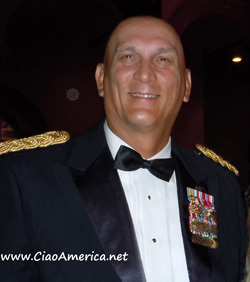 Anthony Odierno (U.S. Army, ret.) who lost an arm in Iraq. He was honored by the Sons of Italy last year. Also present were former U.S. Congresswoman Connie Morella, federal judge Arthur Gajarsa, Anita McBride , who was Laura Bush's Chief of Staff; AIDS researchers Dr. Anthony Fauc, Dr. Robert Gallo, the Ambassador from Italy to the U.S. Giulio Terzi as well as the immediate past ambassador, Giovanni Castellaneta, and Café Milano's Franco Nuschese. Among the members of Congress whoa tended the gala were, Nancy Pelosi, Democratic House Minority Leader (CA), Sen. Sherrod Brown (OH,; and Representatives David Cicilline (RI), John Courtney (CT), John Larson (CT), and Betty Sutton (OH). A highlight of the evening was the presentation of a Sons of Italy scholarship of $10,000 to SSgt. 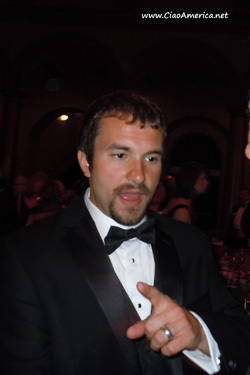 Salvatore Giunta, who is the first living American serviceman to receive the Medal of Honor since Vietnam. He received the nation's highest honor for valor after risking his life to save a wounded comrade who was being carried away by Taliban terrorists during an ambush in Afghanistan. SSgt. Giunta was introduced by Gen. Odierno, who said, "This young soldier represents what our military is all about: unwavering dedication to each other...we never leave a fallen comrade." Turning to SSgt. Giunta, he said, "You have lived up to the expectations of your great grandparents." They came from Sicily in 1904 and settled in Iowa where SSgt. Giunta was born and raised. The general also thanked the Sons of Italy for its dedication to education and leadership. When it was his turn to speak, Sergeant Giunta thanked the Sons of Italy for its generosity in providing him with the means to finish his education. He will leave the Army in June to attend Colorado State University where he will study environmental science. "I am only one of many serving in the U.S. military today," he said. "I appreciate the honors I have been receiving, but I did what thousands of others do every day: fight for this country." Both Gen. Odierno and SSgt. Giunta were given standing ovations by the audience who frequently punctuated the servicemen's remarks with loud applause. Also recognized that evening were 10 young Italian Americans who received the SIF's national scholarships and will now attend many of America's top universities. 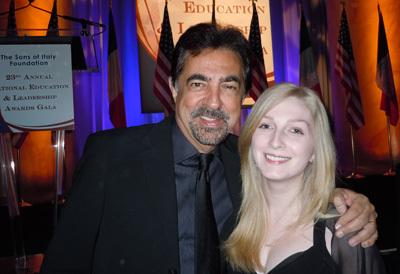 The Master of Ceremonies was actor Joe Mantegna. 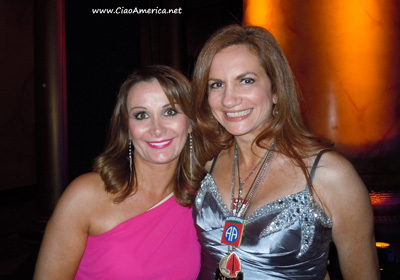 Performing that evening was the popular Italian singer, Giada Valenti and singer/songwriter Theresa Sareo. Ms. Sareo lost her right leg during a traffic accident in 2002 and frequently performs for injured troops at Walter Reed Army Hospital, near Washington, D.C.